Super Rugby kicks off soon in Australia, New Zealand, South Africa, Argentina and Japan. We have all the 2019 season predictions, including tournament winner, to make the final, top points scorer and tournament exotics. It’s not surprising to see four Kiwi teams head the market but due to the conference system, we wouldn’t be ruling out some of the stronger South African sides. Rugby is consistently a good sport to bet on and we’re excited for the upcoming Super Rugby season. Betting against the Crusaders has never been a wise decision and the defending champions look set to make another deep run in the Super Rugby tournament. Despite it being a World Cup year, and that will affect the Crusaders throughout the year, they’re still a strong side and we think bookmakers are being generous by offering $4 for the southern men to win. They are paying $2.10 to make the final and that will be a good bet for those wanting some more insurance. The Crusaders are always a rock-solid bet and we would be surprised to see them out of contention. 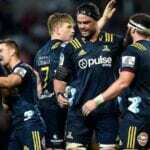 Boasting a team lineup that resembles the All Blacks, the Hurricanes play an exciting brand of rugby and although they can hurt them when it comes down to crunch time, this is their best chance to win a Super Rugby title. With the likes of the Barrett brothers in the team, the Hurricanes have plenty of talent and experience to call upon. They looked good in 2018 but they came unstuck in the playoffs. They have a tough schedule to start the season with the Waratahs and Crusaders in back-to-back weeks, but if they get through both of those games, expect the $4.50 price to be slashed significantly. Beaten finalists in the last two Grand Finals, the Lions should dominate the South African conference and their road to the final will be easier than most teams. We’re surprised at the $10 on offer and the $3.20 to make the final is shorter than the likes of the Chiefs and Highlanders which face a much harder conference. We don’t necessarily like the conference system as the best teams don’t always make the final, but this plays into the hands of the Lions and those odds are too good to pass up. Lions are $1.60 with bookmakers to win the South African conference and that appears to be good money. Backing Beauden Barrett is a good decision because he not only kicks the goals for the Hurricanes, but he’s also a prolific try scorer. That’s going to help his points total for the season and the Hurricanes are not shy of piling on the points. Missing games would be a negative for backing Barrett but he should be around for most of the season and $8 is a value price from bookmakers. We’re expecting Barrett to improve his goal kicking this season, which has come under some criticism, but he’s all class and should go well again. We’re expecting the Lions to go well this season and the high altitude certainly helps the South African kickers. Elton Jantjies is a solid pick at $5 and he currently heads the market. He should get plenty of opportunities to kick goals but he’ll get plenty of penalty kicks throughout the season. South African teams have no problems in taking penalty kicks and considering they’re worth more points than conversions, punters must look seriously at this play. What’s the best part of being a quality player on a bad team? You get plenty of chances to show off your skills and Rieko Ioane definitely capitalises on this. The Blues consistently underperform but Ioane knows how to cross the white strip and it doesn’t matter how well the Blues are travelling, he’s going to be scoring tries and plenty of them. $12 is a great price and we’re expecting that to shorten. The Fijian flyer is always featuring on the top try scorer list and he’s a good pick at the odds. Naholo is a powerhouse at the wing position and when he gets close to the line, he’s almost impossible to tackle. He uses his strength and express pace to worry the defence and we’re confident that he’s going to score many tries for the Highlanders this season. The Highlanders are becoming a more attacking club and players like Naholo are going to benefit from this. No team likes winning the wooden spoon but it has to go to one of the franchises. The Sunwolves are the odds-on favourite at $1.90 and they look like the logical play after recording only six wins from three seasons. $1.90 is a short price to take and they have improved with every season, but the Japanese-based side should continue to struggle until they have more experience in their squad. One for value are the Reds at $5. The Reds don’t have much going for them and despite playing in the poor Australian conference, scoring wins could be tough in the Sunshine State this season.